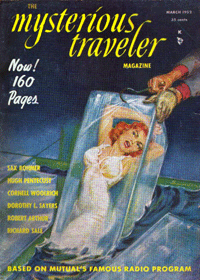 The Mysterious Traveler was the second outing for the prolific writing team of Robert Arthur, Jr. and David P. Kogan, two successful pulp fiction writers and publishers. Their first effort was a 27-program run of Dark Destiny (1942-43). Most of the Dark Destiny scripts are heard again in The Mysterious Traveler (1943), The Sealed Book (1945) and The Teller of Tales (1950). The team of Robert Arthur, Jr., David Kogan, producer/director Sherman 'Jock' MacGregor, and actor Maurice Tarplin was a very successful one for both The Mutual Broadcasting System and Radio station WOR. 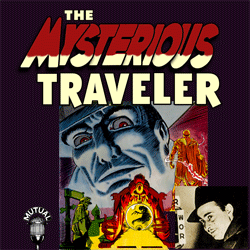 Between 1944 and 1952, The Mysterious Traveler eventually became one of the sixteen highest rated Radio programs of their era. WOR and MBS took great pride in putting together a program that could rival Radio giants CBS, ABC, and NBC throughout the era. During its heyday The Mysterious Traveler spawned several similar thriller genre programs such as The Strange Dr. Weird (1945), The Sealed Book (1945), Dark Venture (1946), Murder By Experts (1949), and The Teller of Tales (1950). The thriller genre was not new to Radio in the 1940s. The Witch's Tale had aired from 1931 to 1938 over The Mutual Broadcasting System and WOR. CBS had tried--and failed--at their own The Witching Hour for three months in 1932. Oklahoma Radio station WKY had successfully aired their own Dark Fantasy (1941) anthology of thrillers, which was immediately picked up by NBC for a national run. But clearly, The Mutual system and WOR appear to have acquired the inside track for the thriller genre for almost two decades during The Golden Age of Radio. This is not to discount in any way the suspense thrillers from CBS and NBC during the same period. Inner Sanctum (1941-1952) aired very successfully over NBC Blue, ABC, and CBS during much the same period as The Mysterious Traveler. Arch Oboler brought Lights Out! (1936-1952) to the air as well for NBC Red, CBS, NBC and ABC. 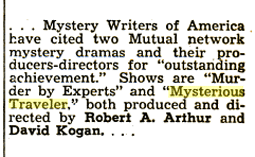 But for much of the period during which it aired, The Mysterious Traveler was providing most of the competition to 'the big three's' more widely heard and promoted thrillers. Enough competition that the same big three networks were forced to continually shuffle their offerings back and forth on the Radio dial to continue to fend off the upstart Mysterious Traveler. The proliferation of such late afternoon and late night thrillers on the radio dial didn't seem to discourage the listening audience in the least. These programs were so popular that people reminiscing about the era tend to conflate Maurice Tarplin and Raymond Edward Johnson in their repsective roles as narrator for many of these scary programs from The Golden Age of Radio. The formula was so popular that it played a role in the restructuring of the type of Radio programming that could be heard during prime-time. With the voluntary adoption of curfews on thrillers and crime-based mysteries by The National Association of Broadcasters (NAB), these programs were forced to air after 9:30 p.m. Eastern time from 1948 on. This is the reason behind the many anecdotal stories from the era of young children listening to their radios under the covers during the Post-World War II era. It was the only way they could continue to hear their favorite thrillers on school nights. "This is The Mysterious Traveler, inviting you to join me on another journey into the strange and terrifying. I hope you will enjoy the trip . . . that it will thrill you a little and chill you a little. So settle back, get a good grip on your nerves, and be comfortable . . . if you can . . . ."
That introduction, accompanied by the now famous sound of the rushing train and its whistle served as the chilling prologue to every episode of the run. The train whistle and doppler sound seemed to improve with each new season--as did much of the foley work throughout the series. Maurice Tarplin for his part, leant a provocatively nuanced sense of anxiety to each new program, both framing the script to follow and interjecting key exposition during most episodes. The Mysterious Traveler was apparently a former medical doctor, a history Tarplin refers to a few times throughout the broadcasts. The Mysterious Traveler eventually found itself up against an even more daunting body than the National Association of Broadcasters and their programming guidelines. Both Robert Arthur, Jr. and David Kogan were activist members of the Radio Writers' Guild, a popular writer's union that was deemed subversive by the infamous House Un-American Activities Committees (HUAC) between 1945 and 1954. This was by no means unusual for the era. The HUAC systematically attacked most significant collective bargaining organizations of the era for their union and organizing activities, which the predominantly right-wing Republicans in control of Congress at the time, deemed a threat to Big Business in any form. The larger, older unions managed to weather the scrutiny of the HUAC. It was predominately the smaller artists' and trade unions that the HUAC seemed most successful at bullying throughout the era--with Hollywood moguls' full support. Arthur and Kogan's very visible lobbying, organizing and picketing efforts on behalf of the Radio Writers' Guild during the late 1940s and early 1950s ultimately brought the HUAC down on Radio station WOR and the Mutual Broadcasting System. Both WOR and MBS predictably caved under the innuendoes and allegations of the HUAC and terminated The Mysterious Traveler at the arc of its national success. While simply a road-bump to MBS, the blacklisting of one of Radio's greatest writing teams effectively ended their Radio writing careers with the cancellation of The Mysterious Traveler. Though having broken up the team of Arthur, Kogan and MacGregor, Jock MacGregor appears to have weathered the storm, continuing on to a modestly successful career in Television. Arthur and Kogan for their part, launched the Mysterious Traveler Magazine with relative success for a year; both writing and publishing the magazine on a shoestring. Some of Hollywood's less intimidated Television producers continued to employ Robert Arthur's services for another ten years. David Kogan continued to manage and publish the magazine. It's worth noting that the success of the Robert Arthur/David Kogan team resulted in national awards during the early 1950s. 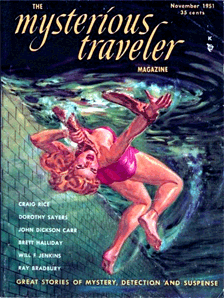 Both The Mysterious Traveler and Murder By Experts garnered Edgar awards--Murder By Experts for 1950 and The Mysterious Traveler for 1953. In the end, the overarching influence of both The National Association of Broadcasters and the HUAC ultimately disintegrated. But they did result in a premature demise for many of Radio's thrillers from the era. Two Mutual network mystery dramas and their producers-directors have been cited by the Mystery Writers of America for "outstanding achievement in producing, directing and writing radio mystery shows." The award-winning shows are "Murder by Experts," Mondays at 8 p.m., and "Mysterious Traveler," aired also on WCLO at 8:30 p.m. Tuesdays. Both programs are produced and directed by Robert A. Arthur and David Kogan. Official presentation of the award, made annually by the MWA, will be made during tonight's "Murder by Experts" broadcast. The dramatization will present a master criminal who thought he could outwit the government for a cool lmillion dollars in cash. The title is "The Dead Can't Testify." Thankfully, The Mysterious Traveler remains one of the highly collected examples of the genre from the era, in many instances introducing new fans to The Golden Age of Radio for the very first time. Run Dates(s)/ Time(s): 43-12-05 to 52-09-16; MBS; Sundays, 7:00 p.m.; 384, 30-minute programs. Recurring Character(s): The Mysterious Traveler [as Narrator]; All other characters varied from program to program. The Mysterious Traveler was portrayed by Maurice Tarplin for most of the run. The most helpful provenances for this effort were newspaper listings. Contrary to Hickerson, The Mysterious Traveler's first timeslot change occured on April 23, 1943 not the widely reported April 30, 1943. How did we uncover and correct this widely reported inaccuracy? We actually listen to our recordings; a novel and ground-breaking approach, we're sure you'll agree. And why is actually listening to one's recordings important? If the answer to that question eludes you, perhaps you need to find another hobby. 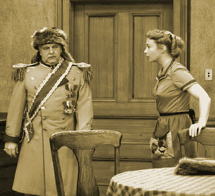 Contrary to Hickerson, The Mysterious Traveler's next day and timeslot change moved it to Saturdays at 10:30 p.m. ["half past ten, Eastern War Time"] on October 7, 1944, not the widely reported 9:30 p.m. slot on Saturdays. The program didn't move to the 9:30 p.m. slot until November 11, 1944. We, yet again, employed our technique of actually listening to our recordings to correct this second, almost universally logged, inaccuracy. It's a regrettable fact of vintage radio collecting--especially in the commercial otr sector--that the overwhelming number of collectors who also catalog their recordings simply don't listen to them. Why bother collecting and cataloging recordings you don't have the time, patience, or integrity to listen to? 43-12-05 to 44-04-16 - Sundays at 7:00 p.m.
44-04-23 to 44-09-24 - Sundays at 3:30 p.m.
44-10-07 to 44-10-28 - Saturdays at 10:30 p.m.
44-11-11 to 45-03-31 - Saturdays at 9:30 p.m.
46-07-14 to 46-09-29 - Sundays at 4:00 p.m.
46-12-01 to 47-09-21 - Sundays at 7:00 p.m.
47-09-30 to 48-10-26 - Tuesdays at 8:00 p.m.
48-11-11 to 49-03-24 - Thursdays at 9:30 p.m.
49-03-29 to 51-02-27 - Tuesdays at 9:30 p.m.
51-03-07 to 51-12-07 - [N.Y. region] Wednesdays at 9 p.m.
51-12-11 to 52-09-16 - [Mutual Network] Tuesdays at 9:30 p.m.
We qualify the last two entries by stating that the Mutual-Don Lee Network did a great deal of its own schedule changing throughout 1951 and 1952. But with only two circulating exemplars of Mutual-Don Lee aircheck recordings we didn't feel it helpful--yet--to attempt to log all of the several permutations in the Mutual-Don Lee Network runs. When more Mutual-Don Lee airchecked exemplars surface, we'll revisit our log and update it accordingly. Some of you will undoubtedly note several significant changes we uncovered vis a vis the schedules above. Almost all of them have the consequence of effectively challenging virtually all of the neat, cookie-cutter logs of The Mysterious Traveler currently in almost universal use. Most obvious is the conclusion that there were not 370, but rather approximately 384 broadcasts of The Mysterious Traveler. In addition, the myriad inaccurate citations of pre-emptions for the series currently in wide circulation are almost uniformly in error. We can't actually refer to them as citations since none of them have yet to be backed up by substantiating proof--or even a mention of what they may have represented. What's apparent as of this writing is that as many as five actual network-wide preemptions have been mischaracterized. Another three episodes have never been even accounted for, let alone disclosed. The series did not end on the widely reported 52-09-02 date. It ended on 52-09-16. If anyone is in possession of a recording of The Treasure of Superstition Mountain, and it announces itself as the final broadcast in the series, then it should almost certainly be re-dated 52-09-16, unless someone can demonstrate that WOR aired two more rebroadcasts after 52-09-02. We have no idea of the methodology that Mr. Hickerson employs in vetting the thousands of submissions he compiles for every issue of his comprehensive logs and updates. It has to be a daunting task. What we do notice most often are the same huge commercial houses or collectors submitting and re-submitting their misinformation to continue to prop up cassette, book and CD sales. There must be a better way to vet those submissions. We're at a loss to understand why any serious vintage recording collector would trust any of the huge commercial vintage recording houses any longer. They have no motivation whatsoever to set production, recording or broadcast history straight. And of course there's that backlog of CD's and cassettes all neatly labeled with misinformation that would have to be either relabeled or reduplicated. That's an expense, isn't it? An expense as in, a tax deductable expense, but an expense nonetheless. Is it any wonder why, from our inception in 2001, we established an FTP service for providing updates, fills, and entire sets of Vintage Radio recordings in .mp3 format? We knew from the get-go that virtually none of the majority of circulating sets of digitized vintage radio recordings would ever be absolutely, positively complete. We took what we thought was the more intelligent route: continually acquiring fills and upgrades to the holdings we were making available through our FTP service. Here's a simple question any of you reading this can answer: "Do you know of any vintage radio recording CD or cassette vendor that provides an update service via FTP should any of the thousands of CDs and cassettes they sell become obsoleted by new recording, dating, labeling or encoding that becomes available after that sale?" We'll help you with the answer. The answer is 'NO,' none of them do. 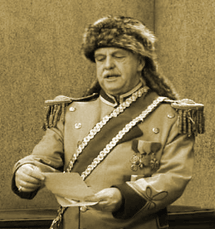 We find it the definition of insanity to continually purchase the same CD compilations over and over and over again from widely varying--and questionable--sources when virtually no one can guarantee with any certainty that the compilation will not be rendered obsolete by the very next historical discovery regarding that canon. Indeed the entire notion of 'distros' is absolutely nuts on the face of it--let alone "Distro Version 2.0 to infinity" of the same, continually evolving canon. 'Certified' according to whom or what?? And when that same 'certifying' group or agency issues Vers. 2.0, 3.0, 4.0 and on and on ad absurdum? What does that say about their certification process?? All circulating episode sequence numbers beyond Episode No. 67 are flat wrong. As we've already demonstrated, there is at least one additional broadcast of The Mysterious Traveler out of WOR New York that hasn't been accounted for in any previous catalog. None of the previously circulating information about time and date changes is accurate. Continuing the Episode numbering from December 4, 1943 to the very end of the last logged broadcast is a fool's errand. It's utter nonsense to even attempt to contiguously log the overwhelming number of program broadcasts beyond a two-year run in the first place. In the second place, it's obvious that The Mysterious Traveler, in particular, has been improperly sequenced for as long as twenty years, due to either someone's mischief during that period, or absence of historical facts--one or the other . . . perhaps both. As a case in point, it was over 16 months between the end of the first broadcasts of The Mysterious Traveler and its next appearance. Can anyone logically conclude that broadcasts fully a year and four months apart were a direct continuation of The Mysterious Traveler's first run? Given the extraordinary number of individuals who've attempted to log The Mysterious Traveler we find it either a statistically impossible coincidence--or collusion and plaigerism--that virtually all other circulating logs omit all correct 'The's' from their titles. You're welcome to continue to misnumber and misdate your canon of The Mysterious Traveler . . . or you're welcome to do what we did: question every log that's ever been published about The Mysterious Traveler and do some more fact-checking--and listening--yourselves. We can state quite confidently as of this latest update that virtually no one reading this has a correctly dated or sequenced canon of The Mysterious Traveler in their holdings--and that includes Radio Spirits and their thousands of supporting legal documents as well. All of the above having been said, we still have little faith in at least sixty of the log entries we've posted below. In our own defense, there's a very good reason why: we have no confidence whatsoever in the widely circulating base of title and date associations for this canon. We've mated up as many of the advertised and announced titles for this canon as we could uncover as of this update. We have little faith in the remainder of them. We don't pronounce our Golden Age Radio research as 'certified' anything. By the very definition, research is imperfect. We simply tell the truth as best we know it. As is our continuing practice, we provide our fully provenanced research results--to the extent possible--right here on the page, for any of our peers to review--or refute--as the case may be. If you take issue with any of our findings, you're welcome to cite any better verifiable source(s) and we'll immediately review them and update our findings accordingly. As more verifiable provenances surface, we'll continue to update the following series log, as appropriate. 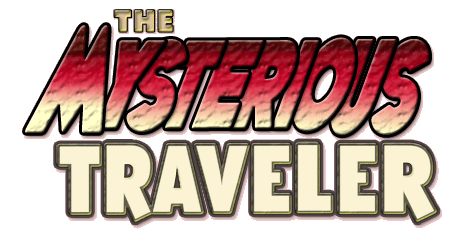 Another program having its premiere tonight is "The Mysterious Traveler," (WOR 7 p.m.). An all star cast is featured. Announces itself as Chapter 13 and Design for Death as next. Announces itself as Chapter 19 and The Accusing Corpse as next. Announces itself as Chapter 20 and Escape by Death as next. Announces a new time: Sundays at 3:30 p.m. MYSTERIOUS TRAVELER a new series of dramas concerned with the weird and the supernatural starts over WHK Sunday at 2:30 p.m. Maurice Tarplin, a veteran of over 3,000 radio appearances, takes the leading role. "The Mysterious Traveler," creator of thrills and chills abounding in vision and vampires, will recount his tales of the weird and supernatural in a new series beginning this afternoon at 2:30 over Mutual-WHBC. This new program will occupy the time formerly held by "Adventures of Bulldog Drummond" which will change to 4:30 p.m. every Sunday. MYSTERIOUS TRAVELER (WHK) -- This new whodunit series opened with a rather obvious tale about two old ladies with a couple of cats who had lost their money and were suspicious of relatives. You guessed the final twist half-way through the broadcast. It was another show for the casual armchair detective. The Mysterious Traveler (WHK), yesterday, was rater a horrible concoction in which a woman, "the queen of cats," eventually takes a fiendish revenge on a husband who spurns her love for another (sounds like old time "meledrammer" doesn't it?). 3:30--Mysterious Traveler presents "My Beloved Must Die"
Announces itself as Chapter 42. Announces The Man The Insects Hated as next. States that beginning October 7th, The Mysterious Traveler will be heard at a new time. It will be presented every Saturday Evening at half past 10 Eastern War Time. The Mysterious Traveler at 9:30--if you can stand any more chillers after the Shadow has reduced you to a bundle of nerves in the afternoon--but we like him. 10:30--WOR--Edward A Teichert, Aria A Albaugh, Others, at Socialist Labor Party Rally, Town Hall. 45-04-14 Freeport Journal-Standard - 8:30--KDTH, Mysterious Traveler. WCLO-MBS will air a new mystery, "The Mysterious Traveler," to replace "Murder Is My Hobby" spot, when latter show moves into 8 o'clock Sunday time. MBS 3 p.m. revival of "Mysterious Travelers" dramas dealing with supernatural. "Mysterious Traveler (WGN): return of series, starring Maurice Tarplin; premiere 'Seven Years to Wait."" Mysterious Traveler, a dramatic series which established a reputation for stories set in the realm of the supernatural, will return to the air Sundays at 3 p.m. via W-G-N and Mutual. 2 p. m.  Mysterious Traveler , (WGN): "It Might Be You." . . .
2 p.m.--Mysterious Traveler (WGN): "Summer Heat." Announces Murder Is No Accident as next and True Detective Mysteries to follow, next. Announces Death Whispers Softly as next. Announces The Falcon episode Death Comes in Boxes next Tuesday. 46-09-03 Wisconsin State Journal - 6:30 p.m.--Adventures of the Falcon (WGN, WIBU): "Death Comes in Boxes," story of international intrigue. Announces As I Lie Dying as next. "Mysterious Traveler (WGN): "As I Lie Dying."" 2 p.m.--Mysterious Traveler (WGN): "As I Lie Dying." 7:00--"Mysterious Traveler" Drama, "Friend of The Dead"
Wierd and macabre tales of the supernatural once again on CKLW when "Mysterious Traveler" returns via MBS tonight at 6. 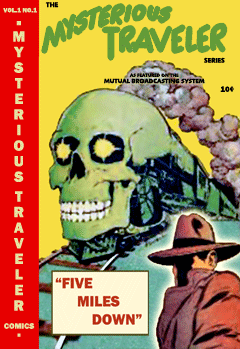 6:00--W-G-N--Mysterious Traveler: "The Locomotive Ghost." 6:00--W-G-N--Mysterious Traveler: "The Man Insects Hate." 6:00--W-G-N--Mysterious Traveler: "The Case of the Wandering Macaroni." 47-09-07 Chicago Daily Tribune - 6:00--W-G-N--Mysterious Traveler: "Vacation from Life." TUESDAY NIGHT "Mysterious Traveler" shifts to WICC-MBS at 8 p.m., with Maurice Tarplin starring in "Dig My Grave Deep." 47-10-07 Chicago Daily Tribune - 7:00--W-G-N--Mysterious Traveler: "Death Rides the Storm." 47-10-14 Chicago Daily Tribune - 7:00--W-G-N--Mysterious Traveler: "Death Is My Host." 8:00--KHJ--A strange story of a murder committed 500 centuries ago by a man living today will be aired tonight on "Mysterious Traveler." 47-11-04 Des Moines Register - MAURICE TARPLIN tells of the world's first murder in "Murder at the Dawn of Time," during his Mysterious Traveler broadcast, 7 p.m. over KCBC. Mysterious Traveler tells "My Date With Death." WGRC 7 p.m.
8:00--"Mysterious Traveler" Drama, "Death Guides My Hand"
10:30 p.m., WCPO: The Mysterious Traveler tells a tale of a man who insured his brother for $20,000 and tried to collect the money when the brother died, but learned that "Death Cancels All Debts." Mysterious Traveler tells the strange story of the ghost who played billiards, "Revenge." WGRC 7 p.m.
10:30 p.m., WCPO: Discarding his customary tales of the supernatural and occult, Maurice Tarpllin, the Mysterious Traveler, tells the heart warming and humorous story of "Mr. Trimble's Turnabout Christmas." A phantom train roard down the track and "Death Is at the Throttle." For the "Mysterious Traveler" has another supernatural tale to unfold on his Mutual broadcast tonight (8 to 8:30 p.m., EST) over WESB. Maurice Tarplin is heard in the title role for a story whose locale is set at a lonely western whistle stop. 48-01-20 Bradford Era - 8:00 P.M.--MYSTERIOUS TRAVELER--A trip to mystery land. 8:00 P.M.--MYSTERIOUS TRAVELER--"Death Has No Vacancy." An escaped killer seeks refuge in a wax museum--and finds "Life Is But a Dream" during tonight's Mutual visit by "The Mysterious Traveler" (8 to 8:30 p.m., EST) over WESB, Maurice Tarplin unfolds this strange tale of a museum curator whose skill at ventriloquism trapped a killer. 8:00 P.M.--MYSTERIOUS TRAVELER--I"ll Dance On Your Coffin." A convict, jailed for robbery, begs police to keep him imprisoned even though he's served his term. He explains his reasons to Mutual's "The Mysterious Traveler," describing how he flubbed the "Chance of a Lifetime" on tonight's MBS broadcast (8 to 8:30 p.m., EST). Maurice Tarplin is the "Traveler." "7 p. m.Mysterious Traveler (WKOW): true story of "The Man Who Died Twice."" 8:00--"Mysterious Traveler" Drama, "The Man Who Died Twice"
48-03-02 Louisville Courier-Journal - Mysterious Traveler tells story of "The Ivory Elephant." WGRC 7 p.m.
48-03-09 Wisconsin State Journal - 7 p.m.--Mysterious Traveler (WKOW): finds flaw in playwright's "Alibi for Murder." "Mysterious Traveler (WKOW): bank robbers accidentally find treasure ship." 48-03-30 Chicago Daily Tribune - 7:00-W-G-N-Mysterious Traveler: "Death Is a Dream." "Mysterious Traveler (WGN): professional killers meet meek, psychopathic axe-man." 8:00 P.M.--MYSTERIOUS TRAVELER--"When Killers Meet." 10:00--WHKC-MBS: Mysterious Traveler, "They'll Never Believe Me"
"Mysterious Traveler (WKOW): "Murder in Jazz Time" to Hazel Scott recordings." "THE LITTLE MAN Who Wasn't There," a race horse mystery yarn, will be dramatized and narrated by Maurice Tarplin on "Mysterious Traveler," 7 p.m. over KCBC. When a sister unwillingly assumes the evil personality of her twin, there's bound to be trouble, according to Mutual's "Mysterious Traveler," who explains why during tonight's story drama 8 to 8:30 p.m., over WESB and WESB-FM. One sister marries and her twin tries to win the husband's love. The story is titled "They Who Sleep." Mutual's "Mysterious Traveler" heard tonight at 8 over WESB will materialize bi monthly in comicbook form. The first picturization is due to hit the stands on June 1. 48-05-18 Chicago Daily Tribune - 7:00-W-G-N-Mysterious Traveler: "Death Writes a Letter." 7:00KHJ. Flying the famed India-to-China hump is no picnic under normal circumstances. But when a veteran pilot admits that "Death Is My Co-pilot" during these flights, trouble starts, during the airer, "The Mysterious Traveler." 8:00 P.M.--MYSTERIOUS TRAVELER--"Death Is My Co-Pilot." 48-06-01 Chicago Daily Tribune - 7:00-W-G-N-Mysterious Traveler: "Strange Voyage." 10:30 p.m., WCPO: "Murder Is My Business," the Mysterious Traveler story scheduled for tonight, describes how a radio mylstery story writer murders a program director. "Mysterious Traveler (WGN): "Queen of the Cats" (on WKOW at 7)." 48-06-22 Chicago Daily Tribune - 7:00-W-G-N-Mysterious Traveler: "The Zero Hour." "Mysterious Traveler (WGN): writer uncovers Martian plot to invade earth (on WKOW at 7)." "Mysterious Traveler (WGN): murders find out they aren't (on WKOW at 7)." The Mysterious Traveler will describe how two murderers feel when advised that they haven't committed a murder during You Only Die Once at 8 over MBS. 10:00--WHKC-MBS: Mysterious Traveler, "The Man Who Vanished"
"Mysterious Traveler (WGN): a publicity stunt to promote sales of a new mystery novel backfires"
48-07-13 Bradford Era - 8:00 P.M.--MYSTERIOUS TRAVELER--"Bury Me Deep." "Mysterious Traveler (WGN): claustrophobia in cabin of sinking ship (on WKOW at 7)." 48-07-20 Bradford Era - 8:00 P.M.--MYSTERIOUS TRAVELER--"The Chase" aboard a sinking ship. 10:00--WHKC-MBS: Mysterious Traveler, "The Chase"
48-07-27 Akron Beacon Journal - 8--WHKK, Mysterious Traveler: "The Unexpected." "6 p.m.- (WGN): kill-crazy egomaniac stalks a city's streets"
48-08-03 Bradford Era - 8:00 P.M.--MYSTERIOUS TRAVELER--"Terror By Night." 10:00--WHKC-MBS: Mysterious Traveler, "The Collector's Items"
48-08-17 Wisconsin State Journal - 6 p.m.--Mysterious Traveler (WGN): "Murder by Proxy (on WKOW at 7). 48-08-17 Akron Beacon Journal - Locally, WHKK will carry a memorial program at 8, in place of the "Mysterious Traveler." 8:00 p.m. Mysterious Traveler. A young reporter, working on a sensational crime expose, finds to his chagrin that the criminals he uncovers are his own relatives, in "Murder by Proxy." Maurice Tarplin plays the title role. KQV. "Mysterious Traveler (WGN): armored car robbed, gang and 5300,000 disappear (on WKOW at 7"
8:00 p.m. Mysterious Traveler. A $300,000 robbery in which crooks and cash disappear provides the Traveler with a strange story called "Unsolved." Maurice Tarplin will be starred. KQV. MYSTERIOUS TRAVELERMaurice Tarplin tells of "Unsolved"; WNAC, 8. "Mysterious Traveler (WGN): woman marries man to convict him of murder (on WKOW at 7)." MYSTERIOUS TRAVELER: Maurice Tarplin In "Murder Has a Price"; WNAC, 8. 10:30 p.m., WCPO: The Mysterious Travelers story is "The Dance of Death." MYSTERIOUS TRAVELER: Maurice Tarplin in "The Dance of Death"; WNAC, 8. MYSTERIOUS TRAVELER Maurice Tarplin in the story of a bomb sent to a parole officer as a birthday gift; WNAC, 8.00. MYSTERIOUS TRAVELERMaurice Tarplln In "Hideout for a Friend"; WNAC 8.OO. 48-10-12 Bradford Era - 8:00 P.M.--MYSTERIOUS TRAVELER--"Broadway, Here I Come!" 10:00--WHKC-MBS: Mysterious Traveler, "Broadway, Here I Come!" 8:00 P.M.--MYSTERIOUS TRAVELER--Explains how a "Welcome Home" was really a death rattle in disguise. 9:30 p.m., WCPO: "Death Wears a False Face," story of a stock market investor, is told by the Mysterious Traveler. Maurice Tarplin, Mysterious Traveler, relates a story of a magician's wife who steals husband's tricks. WGRC 8:30 p.m.
ON MUTUAL--WBCK--An unusual Christmas tale of two pilots bailing outof their plane into a strange land will be told by the Mysterious Traveler at 9:30. 9:30 p.m., WCPO: Two parachuters dropinto "A Town Named Christmas" during the Mysterious Traveler broadcast. 49-02-24 Brooklyn Daily Eagle - 9:30--"Mysterious Traveler," "Time Is Running Out," WOR. 9:30 P.M.--MYSTERIOUS TRAVELER--Tells the tale of the two test pilots who try out a rocket and go hurtling off to "TOMORROW." Mysterious Traveler narrates "Murder At the Mardi Gras." WGRC 8:30 p.m.
9:30 P.M.--MYSTERIOUS TRAVELER--Maurice Tarplin as the "Traveller" tells another of his unusual tales with the Mardi Gras as a background. A neat swindle, concocted by a big business racketeer and an unemployed accountant, provides Mutual's "Mysterious Traveler" with another fascinating tale for his broadcast tonight, 8:30 to 8:55. The dramatization, titled "The Dead Can't Testify," reveals the elaborate plans prepared by the duo to swindle the government out of tax money--almost! 49-03-29 Battle Creek Enquirer - At 9:30, Mysterious Traveler tells the dramatic story, "Death Has a Cold Breath." 'Nuff said. 9-10--Winston Churchill, Discussing "The Twentieth Century--Its Promise and Its Realization," at Massachusetts Institute of Technology--WNBC, WOR, WJZ, WQXR. 9:30 p.m., KQV--The Mysterious Traveler. If your brother is murdered and the two killers escape the electric chair, what would you do? The "Mysterious Traveler" program uses an unusual format and listeners are invited to board the train with the "Traveler" as he carries the story swiftly along. Plans are being made to extend the "Mystery" programming for Tuesday nights so fans can stay tuned for a full evening of dramatic and stirring adventure. Blackmail is enough to drive anyone crazy, especially when a talented actor is doing the gouging. This grim bit of philosophy will be broadened during Mutual's "Mysterious Traveler" on WCLO-WCLO-FM at 8:30 tonight, entitled "Out of the Past." 49-05-03 Akron Beacon Journal - 9:30--WHKK, Mysterious Traveler: "Murder Begins At Home." 8:30-KHJ--A 20th Century businessman finds himself catapulted into the year 2144, where an Amazonic society dominated by women is in full sway . . . That is the story when the "Mysterious Traveler" introduces us to "Escape Into the Future." 49-05-27 Long Beach Press Telegram - 8:30-KHJ--The "Mysterious Traveler" discovers a fantastic lost colony of explorers . . . sealed for over a century in a dark cave . . . when he goes behind the "Locked Door." 49-06-05 Akron Beacon Journal - 9:30 WHKK, Mlysterious Traveler: "Case of George Foster." 49-06-07 Chicago Daily Tribune - 8:30-W-G-N-Mysterious Traveler: "Die Once, Die Twice." 49-06-28 Chicago Daily Tribune - 8:30-W-G-N-Mysterious Traveler: "She Walks With Death." 49-07-01 Long Beach Press Telegram - 8:30-KHJ--"The Mysterious Traveler" reveals the case of the woman who "Walks With Death" when her disgruntled husband hires a professional killer to dispose of her. 49-07-19 Akron Beacon Journal - 9:30--WHKK, MYsterious Traveler: "Murder Is So Fatal." 49-07-22 Long Beach Press Telegram - 8:30-KHJ--"The Mysterious Traveler" proves the old adage . . . "Money Is the Root of All Evil." 49-07-29 Long Beach Press Telegram - 8:30-KHJ--A young woman is haunted by strange voices predicting things to come . . . Despite this, she is in for quite a surprise when the 'Mysterious Traveler' tells the story of the "Voice of Tomorrow." 49-08-02 Akron Beacon Journal - 9:30--WHKK, Mysterious Traveler: "The Planet Zevius." 49-08-09 Chicago Daily Tribune - Chicago Daily Tribune - 8:30-W-G-N-Mysterious Traveler. "Brain Guy." 49-08-16 Chicago Daily Tribune - 8:30-W-G-N-Mysterious Traveler: "Murder Spins the Plot." 49-08-30 Chicago Daily Tribune - 8:30-W-G-N-Mysterious Traveler: "The Treasure of Superstition Mountain." 49-09-06 Louisville Courier-Journal - Mysterious Traveler narrates "Flight From Fear." WGRC 8:30 p.m. THE "TRAVELER" SHOUTS OUT IT'S "DESTINATION, DEATH"
If you're plotting to kill your husband it's nice to hire a sharp-shooter to do the dirty work. Of course it can become a little embarrassing if hubby is a crack shot, too. That's what one wife learns to her dismay during Mutual's "Mysterious Traveler" tale titled "Destination Death," (9:30 to 10 p.m.). 49-10-11 Anniston Star - You peer through the multi-thickness of a glass port-hole of your space ship as you return to earth with the Mysterious Traveler tonight. Suddenly before your very eyes creamy, mushroom-shaped clouds appear all over the planet and it vanishes in a gigantic cosmic blast. This is the strange and terrifying story told by the Last Survivor on the Mysterious Traveler tonight at 8:30. 49-10-18 Cincinnati Enquirer - 9:30 P.M., WCPO: Mysterious Traveler. "Nightmare House," story of a woman who visits psychiatrist. 49-10-25 Anniston Star - But when the wrong person is killed that's a mistake you'll pay for doubly. So says Mutual's "Mysterious Traveler," who'll explain this strange situation tonight at 8:30 when he tells about "No One On The Line." Ever look into a mirror and see someone else? That's the tale on Mysterious Traveler at 9:30 p.m. on WESB and WESB-FM. 49-11-15 Long Beach Press-Telegram - 7:00--KHJ--A man stares into a mirror and a strange face peers back at him . . . That is the terrifying experience related by the "Mysterious Traveler" tonight. 49-12-06 Long Beach Press-Telegram - 7:00--KHJ--"Mysterious Traveler" tonight unwinds a drama behind the query, "Why don't you die?" 49-12-06 Cincinnati Enquirer - 9:30 P.M., WCPO: Mysterious Traveler. "Why Don't You Die," is the taunt a wife hands her drunken husband until he does. 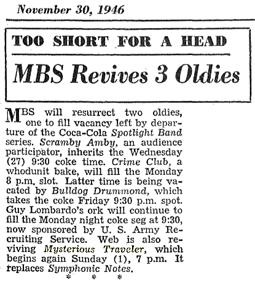 49-12-13 Cincinnati Enquirer - "THE MAN NO ONE KNEW," tale of the "Mysterious Traveler" on MBS-WCPO at 9:30 p.m. today, may cause some excitement similar to Orson Welles's "Man From Mars." This mystery story tells of the preparations men from Venus are making to invade the earth. It is a fictional drama. 49-12-20 Cincinnati Enquirer - 9:30 P.M., WCPO: Mysterious Traveler, Tale of "The Luck of the Irish." 49-12-27 Wisconsin State Journal - 8:30 p.m.--Mysterious Traveler (WKOW): "Death Comes at Night." A news teletype machine goes haywire and prints the "news of tomorrow" on Mysterious Traveler at 9:30 p.m. on WESB-WESB-FM. 50-01-03 Mysterious Traveler is on tonight at 7, with the Traveler peering into space and revealing what the future holds in store for mankind, when a news teletype machine goes haywire and prints the "News of Tomorrow." Man--Ghost Duel Slightly macabre is "Blind Alley," a duel between a millionaire and a ghost, to be aired on Mysterious Traveler at 9:30 p.m. on WESB. "Blind Alley" is the title of tonight's mystery-adventure on Mysterious Traveler (WHK) 9:30. 50-01-17 Cincinnati Enquirer - 9:30 P.M., WCPO: Mysterious Traveler. "Shadows In The Night." 50-01-24 Tyrone Daily Herald - 9:30 Mysterious Traveler: Dead Man's Story. The Traveler comes through with one of the most eerie tales of all on tonight's 'Mysterious Traveler' program (WESB at 9:30). It's the dilemma about the escaped convict who could have been the wealthiest man in the cemetery or a pauper hiding from the police. 50-02-14 Cincinnati Enquirer - 9:30 P.M., WCPO: Mysterious Traveler. A mobster highjacks an airplane carrying $1,500,000. 50-02-21 Janesville Daily Gazette - A strange macabre plot by means of which a wife sought to rid herself of her unfaithful husband will be unfolded by Mutual's "Mysterious Traveler" on WCLO-WCLO-FM at 8:30 tonight. The story is called "Double Six," and deals with the confusion that results when the "dead" return to haunt two lovers. "Journey to the Unknown" is the title for tonight's Mysterious Traveler over WESB at 9:30. A professor's inventive genius provides a calculating machine that goes beyond human comprehension. Mutual's "Mysterious Traveler" tells what happens to the professor, and gambling gangsters during his broadcast about "The Big Brain" tonight at 9:30 over WESB. The gangsters figured they could control the machine by threats, as they did humans. But glass, wire and steel were too formidable for them. 50-03-21 Shamokin News-Dispatch - WOR 9:30 Mysterious Traveler: Dark Underworld. The strange, macabre story of the quiz-halppy husband who is killed by his wife and her lover will be unfolded by the dark-cloaded narrator during Mutual's "Mysterious Traveler" at 8:30 tonight. The scheming lovers buty the body in the cellar of the husband's old mansion. But the dead man's penchant for quiz programs proves that "No Grave Is Too Deep." Maurice Tarplin is the "Traveler." The Mysterious Traveler tonight will prove that time-tested adage, "When the cat's away, the mice will play" on his weekly train ride over WESB at 9:30. 50-04-04 Cincinnati Enquirer - 9:30 P.M., WCPO: Mysterious Traveler. "The Man From Singapore," mystery. 50-04-11 Louisville Courier-Journal - Mysterious Traveler narrates "Flight From Tomorrow." WGRC 8:30 p.m.
"Death at 50 Fathoms" is the title of tonight's thriller at 9:30 p.m., on WESB. Maurice Tarplin (The Mysterious Traveler) has another eerie tale for WESB listeners at 9:30. Title for tonight's Traveler program is "I Died Last Night." An amazing situation faces the police when "Mutual's Mysterious Traveler" relates the fanciful story, "I Died Last Night," during his broadcast at 8:30 tonight. Although the suspect believed in the hereafter, he was very much alive when he committed the murder that he claimed was physically impossible because, he said, "I died last night." Maurice Tarpin is the "Traveler." "S.O.S." is the title of tonight's Mysterious Traveler over WESB at 9:30. 50-05-09 Detroit Free Press - 9:30 p.m.--CKLW: Mysterious Traveler: The Big Dive. 50-05-16 Gettysburg Times - WOR 9:30 Mysterious Traveler: Midnight Voices. A man falls in love with a "Black Shadow" at 9:30 over MBS-WHK during "Mysterious Traveler"
50-05-23 Detroit Free Press - 9:30 p.m. CKLW Mysterious Traveler: "The Black Shadow." 50-06-06 Shamokin News-Dispatch - WOR 9:30 Mysterious Traveler: Without Crime. 50-06-06 Panama City News-Herald - The mylsterious Traveler, at 8:30 tonight over WDLP tells of a jealous husband who plots the murder of his wife in "Murder Without Crime. 50-06-13 Detroit Free Press - 9:30 p.m.--CKLW: Mysterious Traveler: "Death Wears Two Faces." 50-06-20 Detroit Free Press - 9:30 p.m.--CKLW: Mysterious Traveler: "Die She Must." 9:30 p.m.--CKLW: Mysterious Traveler: "The Time Machine." The wealthy young man took a nap. He woke up to find himself in a sanitorium and married! Mysterious Traveler, 9:30 p.m.--WESB. Announces the repeat of The Planet Zevius, "by request"
9-9:30--Gen. Douglas MacArthur Address, Before Joint Legislature of Massachusetts--WOR..
"Visitors From Infinity" on the Mysterious Traveler over KMAC at 8:30 p. m.
9:30-10--Senator Richard M. Nixon Address, From California--WOR, WCBS. Sherman 'Jock' MacGregor was one of The Mutual System's most successful producers and directors during The Golden Age of Radio. MacGregor began his career in Radio as a singer, heard over Radio as early as 1926, singing mostly minstrel songs and dressed for public appearances of his minstrel act in traditional Highlander garb--kilts and all. Ever the thrifty Scot, Jock MacGregor was quoted in 1927 as boasting that he and his new bride saved the expense of a honeymoon at Niagara Falls by simply listening to its roar over a broadcast on Radio. 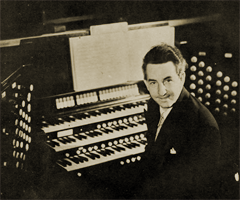 One of MacGregor's contemporaries, 'Sir' Harry Lauder was often heard singing tradional Highland songs over the early Enna Jettick Melodies program (1929). Contemporaneous newspaper articles often favorably compared Jock MacGregor to the more famous Sir Harry Lauder. 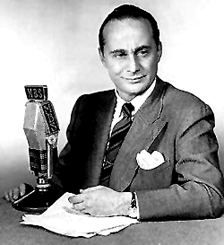 Apparently both loved and respected for his early Radio work, the famous pioneering Radio station KDKA (Pennsylvania) devoted an entire prime-time, 15-minute program to MacGregor on August 31, 1936 as an on-air Farewell Party for him. By 1938 he was producing and directing many Radio programs for NBC-Blue [WJZ] as a staff director and writer. But it was Jock MacGregor's move to the Mutual Broadcasting System's flagship station, WOR that ultimately afforded MacGregor the latitude and artistic freedom that made him famous. Beginning with WOR Summer Theater (1942), MacGregor was soon writing, directing and producing WOR staples such as The Cisco Kid (1942), The Adventures of Raffles (1943) and Nick Carter, Master Detective (1943-1953). Indeed it was while producing Nick Carter that Jock MacGregor first teamed up with the famous fiction writing team of Robert Arthur, Jr. and David Kogan. That same team would soon produce many Nick Carter programs together, as well as the long-running The Mysterious Traveler (1943-1952), The Sealed Book (1945), and several episodes of The Strange Dr. Weird. The team's success producing The Mysterious Traveler was cut short when the series was abruptly cancelled by WOR during the infamous witch-hunts of the HUAC blacklisting years. With the successful team broken up, MacGregor continued producing and directing several Radio programs and early Television programs, occasionally appearing as an uncredited actor. MacGregor produced the successful Inheritance (1953), X Minus One (1957) and Five-Star Matinee (1957) programs for competing networks. During the 1950s Jock MacGregor returned to his acting roots appearing in both Stage productions and Television. MacGregor also helped produce the James Cagney feature Shake Hands with The Devil (1959). The late 1950s and early 1960s found him both acting in Television and producing Television features in Great Britain. MacGregor's last notable appearance on Television was as Jed Morgan in The Wahoo Bobcat (1963), a Walt Disney Presents television episode. 'Edgar' for Best Radio Mystery Drama for The Mysterious Traveler. The Writers Guild of America--East, sucessor to the Radio Writers Guild of 1942. Robert Jay Arthur, Jr. was born November 10, 1909, on Corregidor Island, The Philippines. His father, Lieutenant Robert Arthur, Sr. was stationed in the United States Army Expeditionary Forces with his wife, Sarah Fee Abbey. As an Army brat, Robert, Jr. spent much of his childhood moving from Army base to Army base. He was educated in the public schools of Massachusetts, Michigan, Kansas, and Virginia. 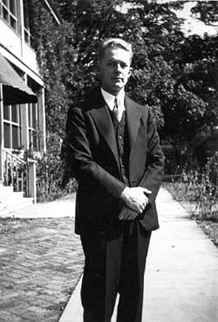 The Valedictorian for his high school graduating class, Arthur had won appointments to both Annapolis and West Point, but declined the appointments, enrolling instead at William and Mary College in 1926. Two years later, he transferred to the University of Michigan, Ann Arbor, and graduated from the University of Michigan with a B.A. in English. In addition, Arthur worked as a writer and editor for pulp western, fact detective, and screen magazines for Dell Publishing, becoming associate editor of Photo-Story, a ground-breaking picture magazine published by Fawcett Publications. He then conceived and edited Pocket Detective Magazine for Street & Smith, the first pocket-sized, all-fiction magazine, which published several of his stories. . The Mysterious Traveler also aired as Adventure Into Fear and 26 of its scripts aired as The Sealed Book. From 1948 to 1951 Arthur and Kogan produced Dark Destiny, an early, well-received, television thriller series. In 1940 he met the woman who would become his second wife, Joan Vaczek, in a class on The Short Story while attending Columbia University. Joan Vaczek was the daughter of a Hungarian diplomat and a budding science-fiction writer in her own right. During the same year that he met his future writing partner, David Kogan, with whom he eventually wrote and produced his first radio show, Dark Destiny (1942). 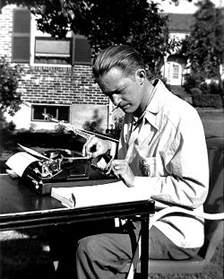 Soon after that the team wrote and produced The Mysterious Traveler (1943), which aired over the Mutual Broadcasting System and eventually won the Edgar Allan Poe Award for Best Mystery Radio Show of the Year for 1952 by The Mystery Writers of America. He'd also won the 'Edgar' for Best Radio Drama for 1950 for Murder By Experts. Robert Arthur and Joan Vaczek eventually married in December 1946, moved to Connecticut and then New York, where they had two children, Robert Andrew Arthur and Elizabeth Ann Arthur. 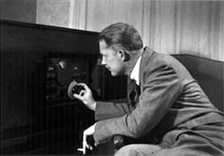 1953 brought the end of his relationship with The Mutual Broadcasting System. He and his partner, David Kogan were both active members of The Radio Writers' Guild. The House Commitee on Un-American Activities (HUAC) had 'determined' that The Radio Writers' Guild was a 'Communist front group'. History has shown that this was simply another of the numerous, shameful union-busting attempts by the HUAC. Their basic aim was to link a growing collective bargaining movement with Communism, so as to benefit the Radio, Television and Film industries by keeping their employees from forming collective-bargaining units--or unions. The Supreme Court of the United States, in 1937, had ruled the 1935 National Labor Relations Act to be constitutional, but when ultra-conservatives came to power during the Cold War years, they determined to find other ways to undermine the collective bargaining provisions of the Act. The HUAC's naked fear-mongering tactics succeeded for several of the most shameful years in American history. The Committee's sham hearings were eventually brought down by the very industries they were attempting to benefit--Radio and Television. To its shame, The Mutual Broadcasting System and its radio station WOR, caving under pressure from their affiliates and corporate sponsors, abruptly canceled The Mysterious Traveler and Robert Arthur's career as a Radio Writer effectively ended. The Mysterious Traveler had consistently been rated among the top sixteen most popular Radio programs of the era. Robert Arthur, Jr. had written and produced over five hundred radio scripts for his two shows as well as for Dark Destiny, The Sealed Book, The Shadow, and Nick Carter, Master Detective. 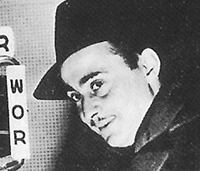 After 1952, Arthur worked as a co-producer for ABC's radio show Mystery Time as well as continuing to write and publish pulp fiction. In 1959, he moved to Hollywood where he worked in television, writing scripts for The Twilight Zone. He also worked as a story editor and script writer for Alfred Hitchcock's long-running Alfred Hitchcock Presents for television. Robert Arthur, Jr. is also credited with writing most of Hitchcock's droll prologues for the Alfred Hitchcock Presents programs. He moved back to New Jersey in 1962, where he lived with his father's aunt, Margaret Fisher Arthur, until his death in 1969 at the age of 59. Among pulp fiction fans and Golden Age Radio fans alike, Robert Arthur's stories and scripts remain some of the most rivetting, compelling fiction from the Golden Age. He and his partner, David Kogan, continue to acquire new fans with every passing generation through the enduring magic of Golden Age Radio.